Ubuntu Linux - potentially other Debian based distributions. A unique RTS with a campaign, co-op and passive-competitive gameplay. Splee & Glob: Monster Defense is an Action Real Time Strategy game for PC, Mac and Linux. Potentially available in the future for Wii U, PlayStation 4 and XBox One, depending on the success of our Kickstarter campaign. In Splee & Glob, the player defends a bizarre monster-filled world against A.I.-driven robots through third person combat and clever tower-building. While introducing new challenges through non-linearity, the game avoids players being overwhelmed in online play. Thus, it is suitable for die-hard genre fans and at the same time provides a frustration-free experience for casual gamers. In a strange world inhabited by creatures which you might call monsters, there was peace, but it could not last. One day a crazed robot army arrived with the sole objective to exploit the planet's precious resources. It's now up to the nerdy engineer Splee and her hunky pal Gløb to stop the invaders. 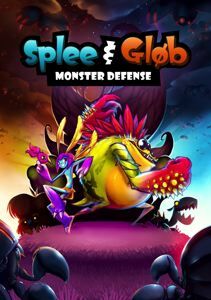 In Splee & Gløb: Monster Defense, up to two players take control of the unlikely couple to fend off invaders through strategic tower-building, crowd control and dynamic third-person combat.